The Mighty 'Well earn a home tie in round five against Dundee after beating Hearts by a penalty goal to nil in the replay at Fir Park. We played some brilliant attacking football in the first half then defended stoutly in the second. The home crowd were cheered before the kick off with the news that our manager was not to be further distracted by the national job and the players celebrated the news with a fine first half performance.This game had all the components of a cracking cup tie.A ten minute delay to let the crowd in, great attacking play from us in the first period,a penalty, no nonsense defending in the second and the crowd anxiously watching the clock as five added minutes were played out at the end. 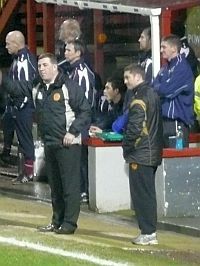 Paterson duly returned but McGarry reported being unwell and Fitzpatrick stood in his midfield position.We took control right from the kick off and Clarkson showed the energy and commitment which typified his contribution for the whole match by robbing the defence and firing over a dangerous cross when the game was only ten seconds old. McCormack then got in on the act by flighting a wicked free kick into the box causing some confusion in the Hearts' defence.Porter made a brave contribution in setting up the attack which resulted in the penalty.He battled to head the ball wide to McCormack and took a hit for his efforts.McCormack's attempted lob struck a high defending arm and the referee had no second thoughts about pointing to the spot.He dispatched the spot kick with ease when Porter had been treated. We then produced an outstanding ten minute spell of fast, flowing football and pinned Hearts back in front of their large support in the South Stand but we were to reach the break without scoring a second.In added time Porter sustained another knock and was replaced by Darren Smith. Nade replaced Cesnauskis in a half time change and the two substitutions resulted in an altered game.Nade made an immediate impact and he continued to give Reynolds and Craigan a hard time.Darren Smith found it difficult to adjust to the frantic nature of the game which grew ever more physical.Every 50:50 ball was contested fiercely and Hearts were camped in our half for long periods. Our defending was typical of the old Scottish style - the ball got a beating and flew over the East Stand several times.Velicka should have equalised on the hour but he saw his shot come off the post.That was the only clear goal scoring opportunity which they created.Many other half chances were block by our committed defence. But we survived and can look forward to hosting Dundee at Fir Park in the next round.